Flag of the territory of Saint Helena. The three islands that make up a federated British Overseas Territory are grouped off the coast of Africa, in the South Atlantic, with the island of Tristan da Cunha being commonly referred to as the most remote inhabited place on earth. The island of Saint Helena was initially discovered by the Portuguese in the very early 1500's, and then rediscovered by Sir Francis Drake in 1577. The islands where not formally inhabited until the mid 1600's when Cromwell awarded the East India Company the rights to build settlements there. The islands slowly grew, initially proving useful for the Royal Navy to base their ships there for raids on the African coast, and then later, the islands proved useful as coaling stations for merchant ships and the Navy. The three islands where initially grouped together as Saint Helena and her dependencies. And this remained with the islands of Tristan da Cunha and Ascension not on an equal level to the island of Saint Helena. Finally, the relationship was levelled in 2009, with a new constitution for the territory being brought in granting the islands of Tristan da Cunha and Ascension the same status as the island of Saint Helena. This saw 1 overall governor responsible for the governing council. However, each island features its own council with 1 administrator reporting up to the council itself. 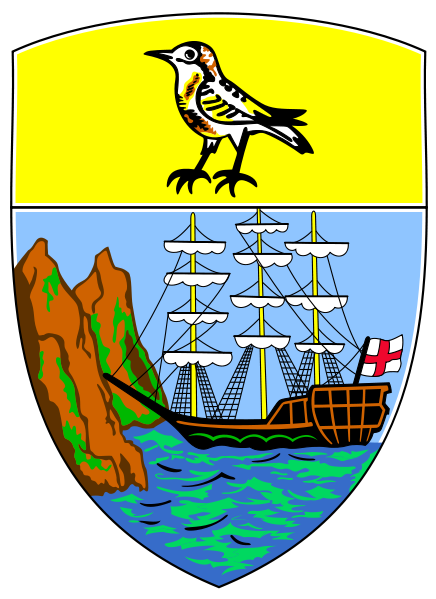 Initially the 3 islands all formally used the flag and coat of arms of Saint Helena, however, unofficially, Tristan da Cunha was using a new flag (officially they still had to use the Saint Helena flag). However, with the new constitution, Tristan da Cunha formally introduced its own flag and coat of arms. Ascension uses the Union Jack of Britain, and is working on creating its own coat of arms and flag. The island of Saint Helena's coat of arms the Saint Helena Plover, and a scene including a ship and the cliffs of the island. The coat of arms where formally granted in 1984. The flag is a standard British Blue Ensign, with the islands coat of arms on the fly.